The best part of Instagram is the steady stream of inspiration, ideas and like-minded people you can gather (Here is a link if you'd like to follow me). 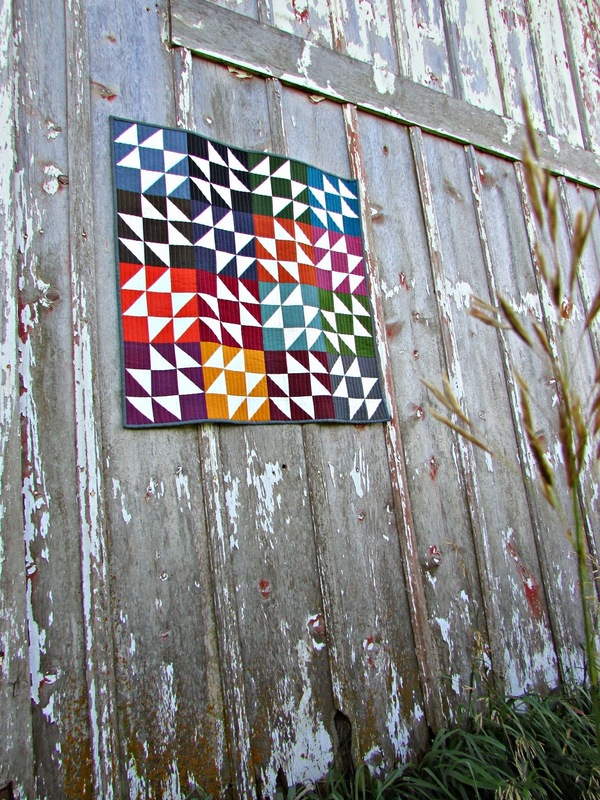 Last week I saw a notice for the start of the Sea Breeze Mini Quilt Along from Gnome Angel. I really liked the simple, graphic design of the block and decided to do my own version. 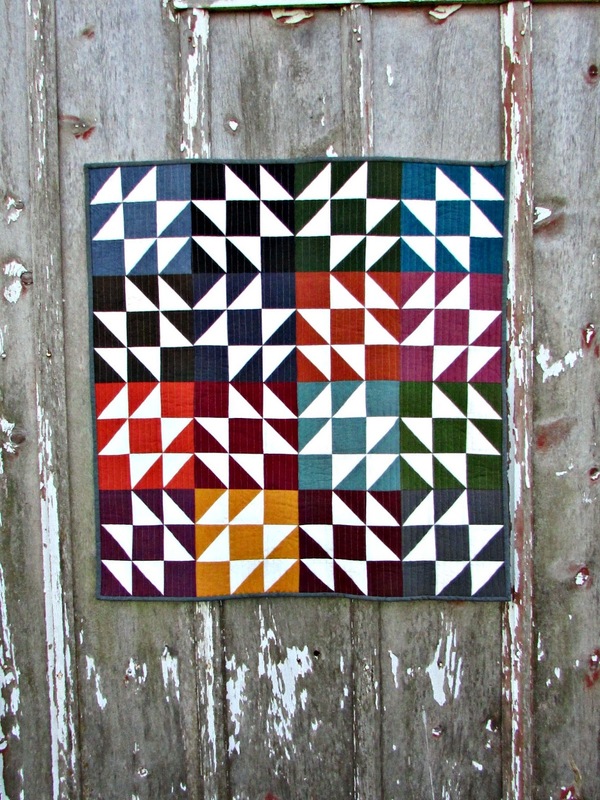 I super-sized it to a 16 block extravaganza of some of my favorite fabrics. I have a love affair going for shot cotton and peppered cotton. I genuinely enjoy working with solids because I love bold designs. Shot cotton and peppered cotton are the best of both worlds. Solids, with benefits...bold and graphic, but truly works of art in themselves because of the color play in the weave (both are constructed out of 2 different colored threads, woven together). In the interest of full disclosure, though, I will tell you that there are several small downsides to working with both of them. Shot cotton must be delicious because every sewing machine I've had wanted to eat it for lunch. Yes, you can start with a leader (a scrap piece of fabric that you begin sewing with). 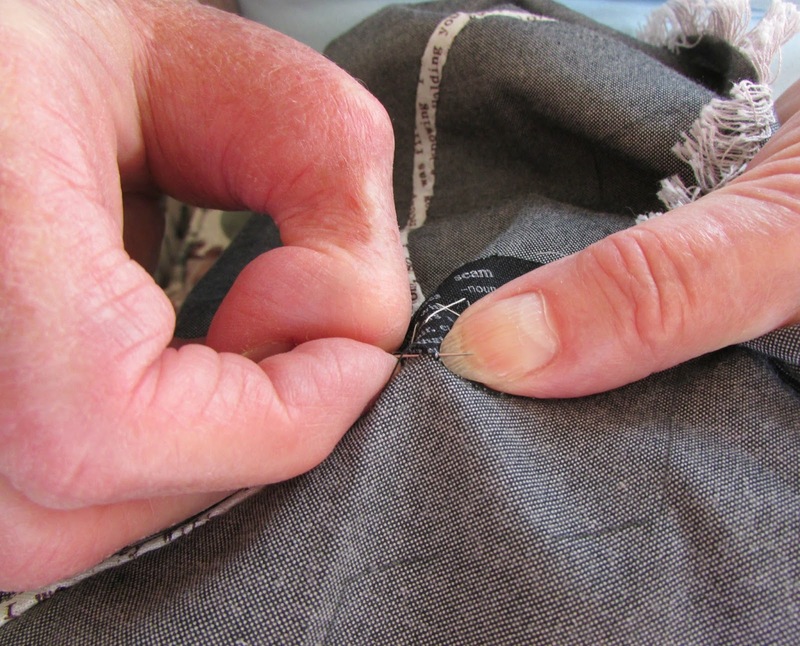 Yes, you could also take a firm grasp of the excess thread from the top spool and help pull the fabric from the back. The way I ended up doing it is to start every seam about one inch from the edge. I would finish the seam, flip my piece over, and after taking a few back stitches to secure the line of stitches, stitched from my previous starting point all the way to the other end. That helped to minimize the warping of my half square triangle points AND the cursing in the craft room. Peppered cotton has a heavier hand than shot cotton. It is luxuriously silky, but it also unravels on the cut edge with handling. I went over the back of my piece several times with the scissors and even with the lint roller, but I can see some thread varicose veins behind a few of the cream half square triangles. Since I am keeping this as a piece of wall art and it was life, not laziness, that led to said varicose veins, I am prepared to live with it. I am also prepared to gently edge you out of the way if you get your nose too close to the quilt on your next visit. I do have limits. Both shot cotton and peppered cotton have "personalities," but I find the results to be worth little inconveniences during construction. The last picture I have of this quilt is one of the best. The last two quilts I made were miniatures for my guild's quilt challenge. On the night of the guild challenge I was my typical why-do-I-always-do-this-to-myself nervous wreck. 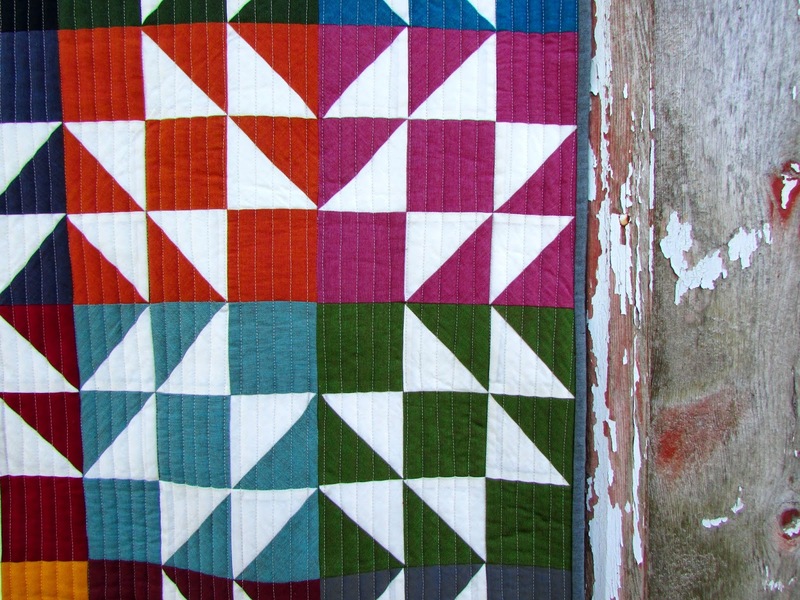 All the butterflies in my stomach died an abrupt death when a single member of the program committee decreed that all unlabelled quilts should not be considered for our competition. 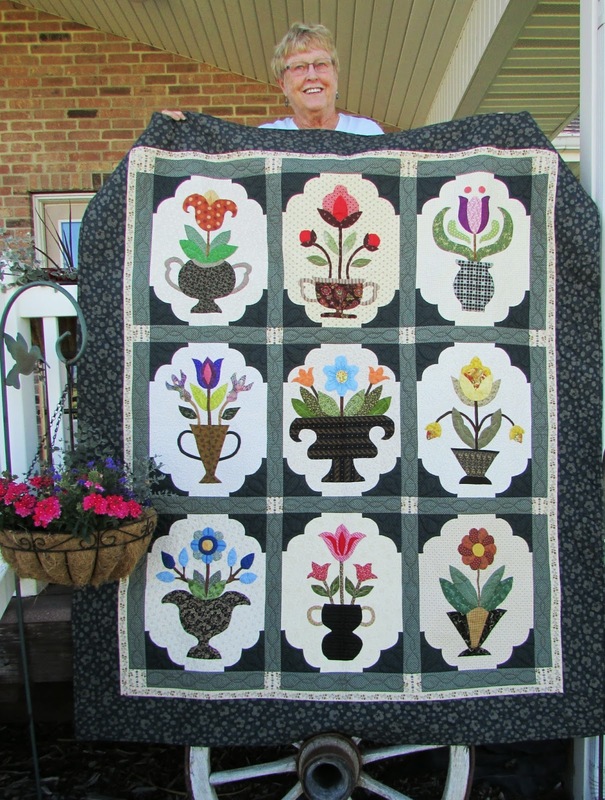 The guidelines for this challenge were the same as every other year, "the quilt must be bound, three layers, quilted and labelled." Unlike every other year, this year they were actually going to check for labels. Well, you guessed it. Mine weren't labelled. I wasn't trying to be subversive, I had just given both projects an envelope style back so that they could have a dual display option and it honestly never even occurred to me to label my little pillows. The worst part of the night was after the judging when we had to come up in front of the assembled mass and claim our projects, revealing ourselves as the maker and receiving our accolades. 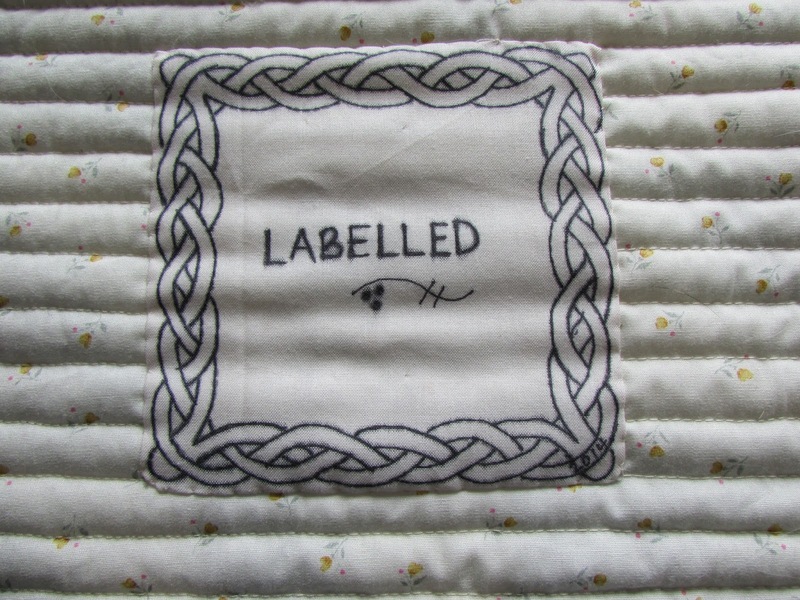 One of the nicest women in the guild handed me my project and said with authentic anguish, "It wasn't labelled." I went home that night with a broken heart. Not because I didn't win, but because my work was defined by deficiency. As I am wont to do when I am troubled, I searched my mind for the perfect story I could tell myself. Something to give a negative experience meaning and channel my emotions into something constructive. It took me a few days to get my sass back and remember this little gem. My dad was a colorful and interesting man, and as such, had colorful and interesting friends. One of my fondest memories of childhood was the steady stream of friends that stopped by at our farm for a chat. Every time a new visitor arrived, Dad would say, "Miss Jill, why don't you go ice us up a beer." And, every time I would reply, "Dad, we're all out (we didn't drink) and I'm pretty sure you don't put ice in beer." He would shake his head regretfully and ask for a Diet Coke instead. This ritual never got old no matter how many times it was repeated. Afterward, I got to sit in the cool shade of our patio and listen to the stories. One time I remember my dad asking about the personalized license plate on Fred's (not his real name) new truck. Fred told Dad that when he went in to register his new vehicle, he had gotten some guff when he had opted not to get vanity license plates. "What?" the registrar asked in disgust "You're not personalizing? Only a real nobody would get a new truck and not spring for personalized plates." So, ever the sport, Fred decided then and there to get vanity plates. What did they say? Has a nice ring to it, doesn't it? I can't tell you what an immense sense of relief I felt sewing this on the back. It helped me feel better and reminded me of something important. Who gets to define me? NOBODY. I am not so good at just sitting. I have learned from countless drives from our home in Iowa to my mother's house in Idaho (1,250 miles), that I arrive at our destination in better spirits and my husband arrives loving me more if I have something to do. 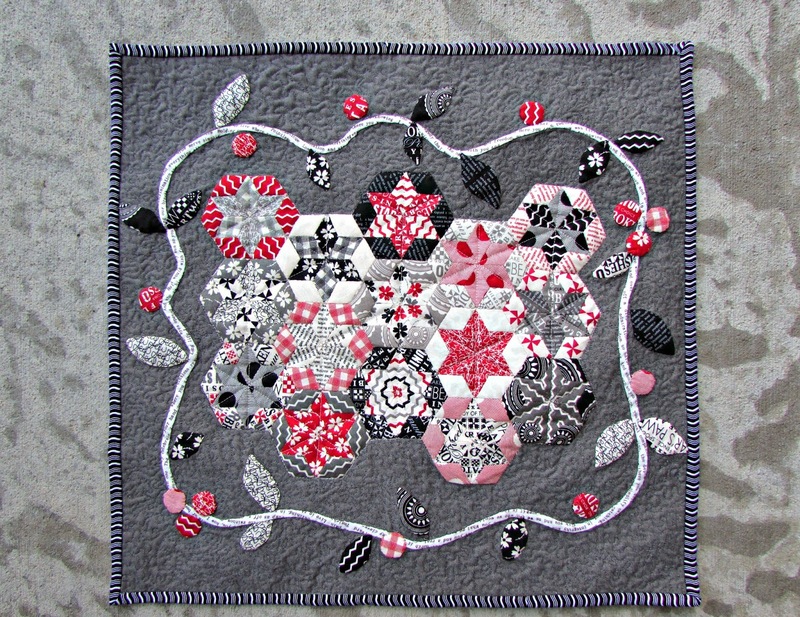 This year I was thinking about my guild's mini quilt challenge so I looked for an English paper piecing project to hand stitch while we were on the road. I found one called Star Hexie on Sew Mama Sew. I reduced the pattern pieces (it IS a mini, after all) and packed myself a charm pack of Mama Said Sew. I hadn't been sewing very long before I started thinking about how to set the hexagons for the finished quilt. I can say with confidence that the only reason I finally settled upon appliqué was that I knew my mom would help me. My mom is the undisputed queen of needle turn appliqué. I can prove that last claim, too. This is a quilt that my mom made for my youngest daughter. Mom planned a spring visit around an applique workshop by Angela Lawrence and the birth of my daughter. Both of those events were SUPPOSED to occur within a week of each other. 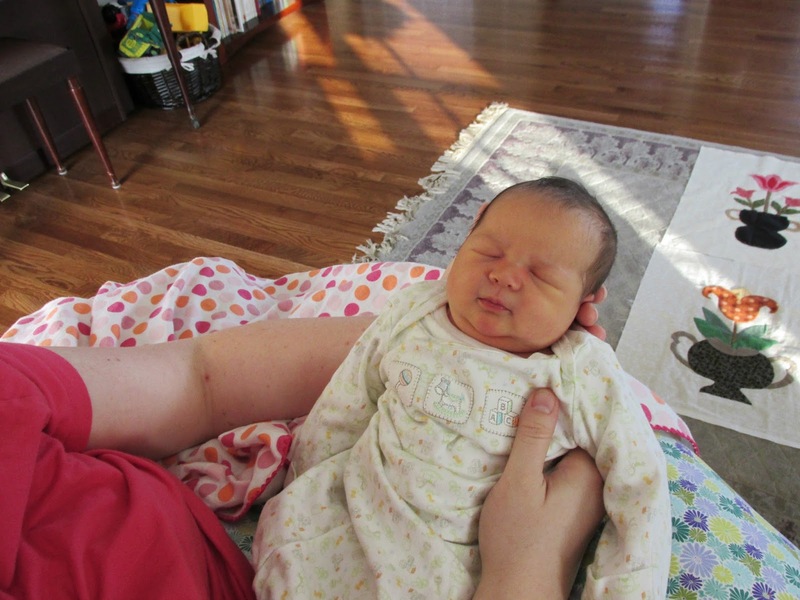 Instead, Mom ended up doing an extended baby watch with me and I ended up with a 9+ pound baby! Needing something to do (maybe it's genetic? ), she started a pattern that she'd gotten at the workshop. The awesome thing is, she was forced to use my fabric. Mom calls my fabric "wild." I think that the real wild thing is to see Loulouthi (top middle, if you're looking for it) in this context! This picture was completely an accident. Mom got distracted by a darling baby girl while she was laying out some of her finished blocks for my inspection. 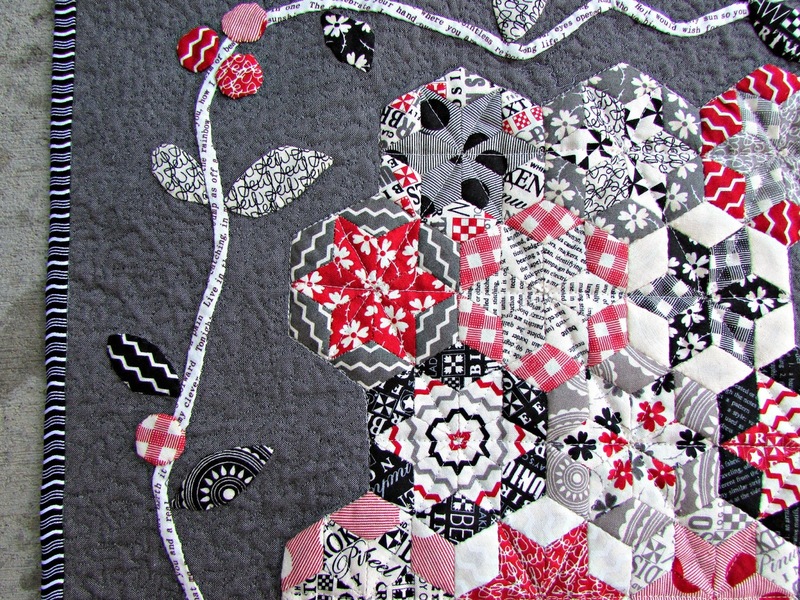 I am beyond pleased to have Miss E and the beginnings of her quilt in the same shot! I made hexies the entire way to Idaho and the entire way back to Iowa and I STILL had a few more to do once I got home. I marked out where the hexagon middle would go on my background fabric so I could have help on the needle turn appliqué. Before I left, my mom showed me a technique that helps give each leaf a sharp, pointy tip. Mom stitched on two of the black leaves for me. You may notice that her right hand is not like yours. When she was 14 years old, Mom was in an accident. A group of friends from her school were driving up the canyon to have a barbeque and a bonfire. Mom was sitting in the back of a grain truck with some of the others and her older brother was driving ahead in a Jeep. Going for a laugh, the driver of the grain truck started purposefully edging the tires up the walls of the canyon. There were screams and yells and laughs as everyone in the back of the truck was thrown off balance. The last time he did that, the motion was severe and abrupt enough that everyone was violently thrown to one side. That time the screams were real. Feeling the vehicle starting to tip over, Mom grabbed on to the side of the steel bed and hung on. The heavy truck fell directly on her right hand, severing an artery and crushing her wrist and thumb. Hearing the thump, her brother turned the Jeep around and arrived at the scene so fast that the dust still hung heavily in the air and the tires still slowly spun on the overturned vehicle. Her brother and friends dug her hand out from under the truck in blood-soaked clay. One of the boys had just received a life-saving merit badge from the Boy Scouts and put it to use. He used a handkerchief and a belt as a tourniquet and stopped the bleeding. He saved her life. Mom's brother drove the Jeep home to wake up their dad. Her father arrived at the small hospital in the next town over and watched the doctor working on his daughter. Dr. Smith tried to reattach the tendons and stop the bleeding. He attempted to place stitch after stitch to no avail. The doctor turned to her dad and told him that the damage was too severe and that there was just too much gravel in the wound. He had no choice but to amputate. "No," her father barked in his stern voice, "Keep trying." He saved her hand. 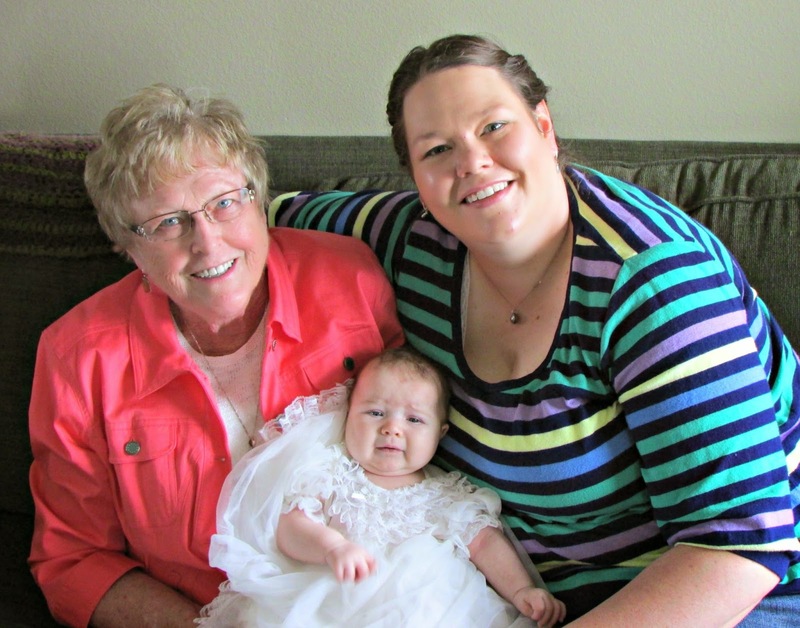 Over the course of a year, Mom had nine surgeries. She contracted an infection so severe she nearly died. At one point, to develop a skin graft, her hand was literally attached to her belly for six weeks. She had to learn to write with her left hand. Gravel and heavy black thread from Dr. Smith's stitches worked their way out of her hand for months after the accident. So much effort was expended in saving the use of her thumb that her wrist was not set and it knit together in a haphazard fashion, giving her only millimeters of movement in her right hand. When I was in high school, my dad took my mother to one of his appointments and asked the orthopedic surgeon to look at mom's hand to see if she could get back a little motion in her wrist and to have help mitigating some of the chronic pain. After looking at the X-ray, the doctor came back in the room shaking his head ruefully. "There is absolutely nothing I can do for you," he said. "Be grateful you have a hand." And she is. I am, too. That so much much beauty can come out of a part of her that saw such ugliness is an inspiration to me. That she was brave enough to even attempt needle turn appliqué as a hobby, knowing that her injuries would change everything from the way she held a needle to the way she placed a stitch with a wrist that doesn't move is an inspiration to me.